Then of course, there are internet memes. With sites like Meme Generator, it’s simple for anyone to quickly make their own (shareable) version of a popular meme. Pretty much everything I’ve argued about GIFs also applies to memes, but I think it’s more up for debate as to whether or not many manifestations of memes are art. Generally speaking, I’d say that memes are to viral art what doodles on napkins are to paintings, except of course that memes exist alongside animated GIFs and other viral art on the web in a way that napkin doodles and paintings generally do not. And of course, there’s no reason that some memes cannot be art. What is Shepard Fairey’s André the Giant / OBEY Giant campaign but an old-school meme? Just like modern internet memes, Fairey’s initial André the Giant image was meaningless, but it gained meaning over repeated viewings and people made it their own with homages and parodies. It seems silly to say, “this is only art if it’s animated,” so of course I don’t mean to say that all animated GIFs are art and all static internet memes are not, but it seems like the people making viral art have gravitated more towards animated GIFs or Vine videos (perhaps including references to memes) rather than straight memes. A parody of Shepard Fairey’s “André the Giant Has a Posse” image. 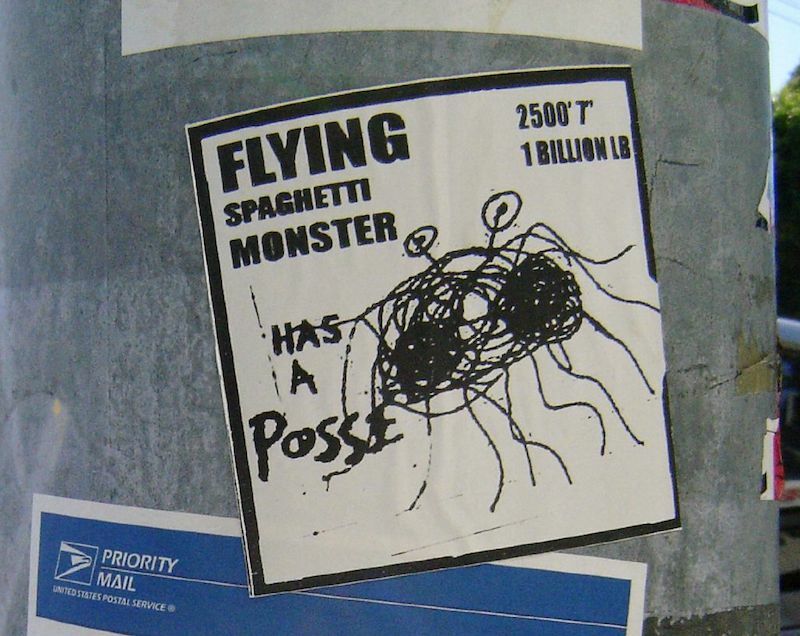 This parody features the Flying Spaghetti Monster. Cropped version of a photo by Richard Lemarchand. Not all animated GIFs or internet memes are going to go viral around the world, and some aren’t meant to. Some GIFs and memes reference things that not everyone will or is supposed to get. And that can be great as well. GIFs referencing Star Trek can still be loved within the Star Trek fan community even if the general popular doesn’t get it or care. And that Star Trek GIF could still be created by a teenager in a small town with no fellow trekkies around. So there’s certainly value in that. But given the way that early internet art was ostensibly for the general public but in actuality only appealed to an elite group, I worry about something similar happening with art on Tumblr. I have to agree with Evan Roth when he says, “Just because it’s online doesn’t mean it’s geared at the Bored at Work Network. A lot of this new, young, net art scene, this second wave of net art, is happening on Tumblr. I’m inspired by this work too and I love it, but I’m also critical of some of it. I think one thing it’s starting to do is isolate itself.” While neither of us think that this new work is as isolating as the first generation of internet art, the thought is still there. References and in-jokes are fine, but that often doesn’t make for good public art Imagine if every new sticker was a parody of OBEY. That’s great from time to time, but it can’t be all that exists because then sticker artists would only be communicating with each other. The Jogging is an artist collective whose work is distributed on Tumblr. While some of their work has a mainstream appeal and would fit right in with a lot of the art getting shared on Tumblr, they also have a distinctly art-world vibe (think: references to Ai Weiwei or Damien Hirst) and some of the posts are so densely layered with in-jokes that you’d have to be a daily reader of the site to understand what’s going on. That’s fine, but it’s closer to first-generation internet art than what Paolo Čerić, Yuriy MiRonoff and other GIF artists more in line with traditional street art are doing.